Preheat your oven to 425, and bring a pot of water to boil for the eggs. Choose a pot that will give the eggs enough space to move around a little, but fill it just enough so that it will cover them. Don't put the eggs in the pot yet. To prepare the asparagus, snap the end off one to see where the tender part of the stalk begins. If the stalks are thick, you can trim them below the part where the first stalk broke (about an inch off the bottom end) and then peel the stalk gently up until about the point where it would break. If you don't feel like peeling asparagus, you can simple cut the rest of the stalks at approximately the place where the first one broke. Put the asparagus on a baking sheet and toss it with the extra virgin olive oil. Season with salt and pepper and roast in the hottest part of the oven for 8-12 minutes. Small, thin asparagus cook quite quickly so watch them carefully! You want them to still be slightly crisp, and bright green, when you remove them from the oven. While the asparagus is roasting, gently place the eggs in the boiling water, one at a time, still in their shells. If one or two of them crack, don't worry, the end result usually isn't affected. Boil the eggs for exactly six minutes, and remove from the water into an ice bath, or a bowl of cold, running water. When they are cool enough to handle, peel the eggs. Place the asparagus on plates and squeeze a little lemon over them. Lightly chop the flowering herbs. Place an egg or two on each plate and cut it in half over the asparagus. (you don't want to cut them on a separate cutting board, since the yolk is still runny and you'll lose some of the best part!) 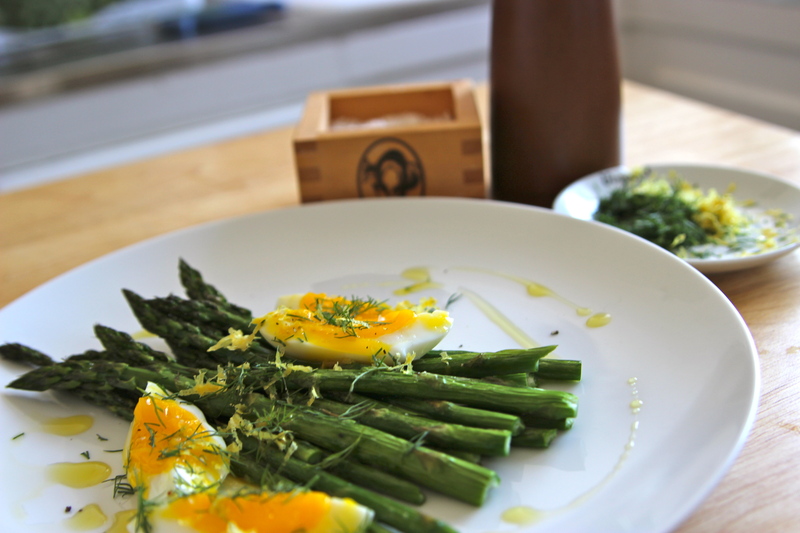 Sprinkle the eggs and asparagus with some of the flowering herbs, and serve. Most anything makes a good addition to this dish: pesto, cheese, a savory yogurt dip, hollandaise, choose your own adventure!